When it comes to my skincare routine, it’s nothing complicated. I don’t prefer layering too many skincare products just because less is always more. But I had to admit I’m a bit lazy too, so having a basic one which I can stick to every day would be ideal. So with all the research that I got for a combination skin type, the goal is to lessen the oil activity on our skin but keeping it hydrated. 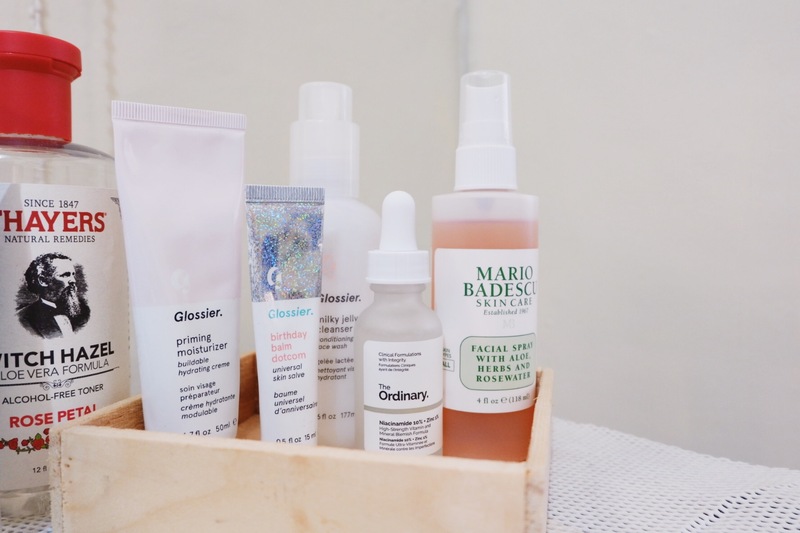 I still don’t have that perfect, pore-less, flawless skin at the moment but with continuous use of these products, it has improved my skin more than ever. Also, I have skipped using K-Beauty brands. Yup, I just don’t think they’re suitable for my skin type. Plus, I don’t aim for my skin to lighten. I stuck to Western and of course, local brands here in the Philippines. If you’re just starting to build your arsenal, I hope this will help you skip trial and error process (and save money too). So, let’s get down to it! First, you have to start with a good cleanser. Based on what I’ve read, those with oily skin should go with the one that has low pH level to wash away excess oil and to maintain your skin’s naturally acidic pH. 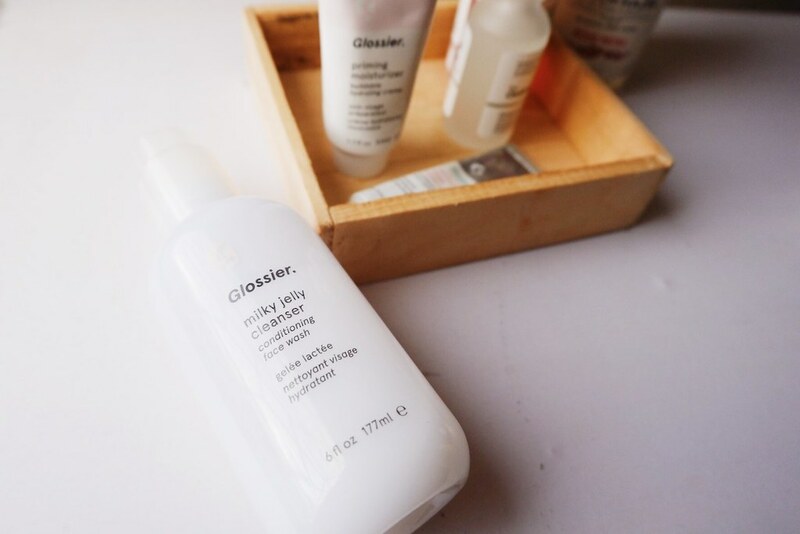 I’m using Glossier Milk Jelly Cleanser for almost 6 months now. Just one pump each time I use it in the morning and at night, and I love how it makes me feel good, clean, and fresh. As much as I love this, on the other hand, it’s not deep cleansing and does not fully remove makeup unlike in the reviews. But I was okay with it, I just made sure I washed my face well and tone after to remove excess dirt and makeup. I honestly didn’t know what this does not until I watched Camie Juan’s vlog. Apparently, toners re-stabilize your skin’s pH levels and prepare your skin to absorb the products you’ll apply after this. I read one article that you don’t need to tone if you have a low pH cleanser but I never skipped it anyway since it also cleanses my skin. 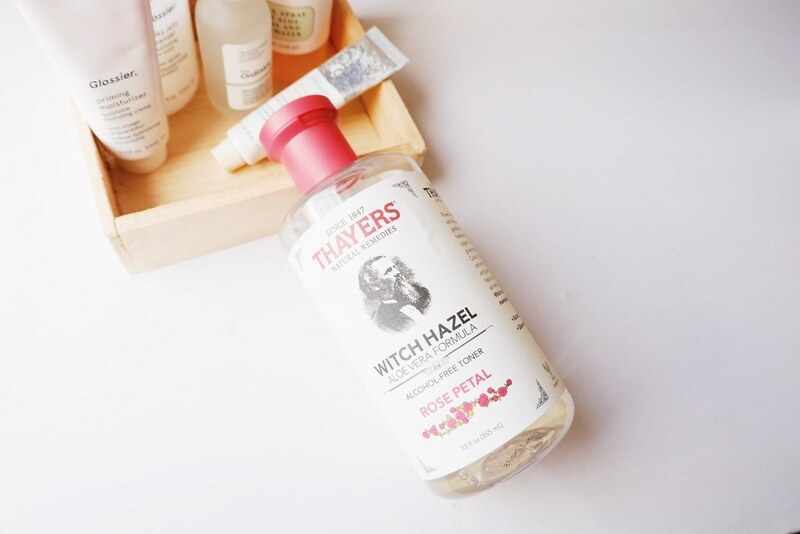 I’ve been using Thayers Alcohol-Free Rose Petal Witch Hazel Toner for two months now, and it actually works for me. It smells really good because of the Rose Petal scent. This also has Witch Hazel, a natural ingredient with an astringent effect without alcohol. The price is average for a 355 ml bottle, haven’t touched half of it! 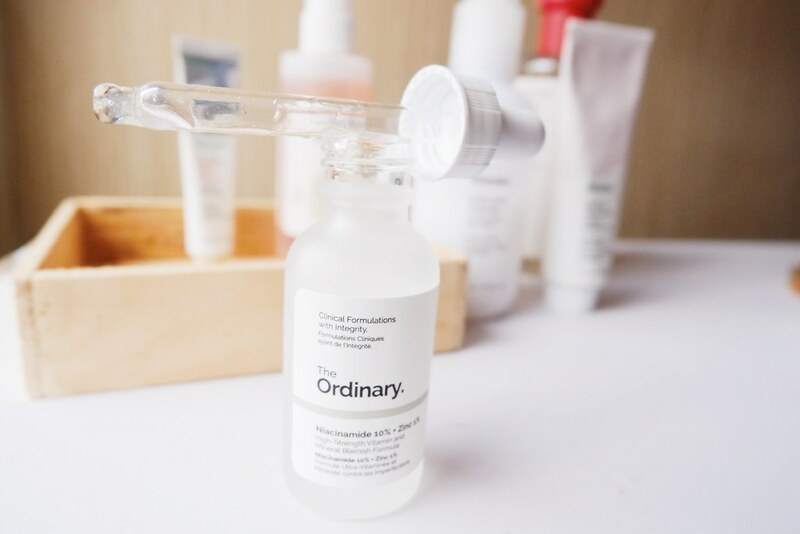 Serums are said to be these beauty elixirs, The Ordinary Niacinamide 10% + Zinc 1% has been my go-to serum. It’s used to reduce the look of the blemishes and balance sebum productivity. I immediately noticed that it reduced my acne scars, and my pores seem smaller now. It sort of dried the acne bumps. This is super effective, you can see results in just a week! I have yet to find another serum to target multiple signs of aging lol. Maybe an advanced night repair serum will do also, currently thinking about Kiehl’s Midnight Recovery Serum. I use this first before applying my priming moisturizer. It has this mild citrus scent, has a cooling effect, and leaves a semi-matte finish. Best of all, no sticky feeling and no white cast too! This is definitely one of the drugstore products HG! One of the most important steps in your skincare routine is to moisturize. 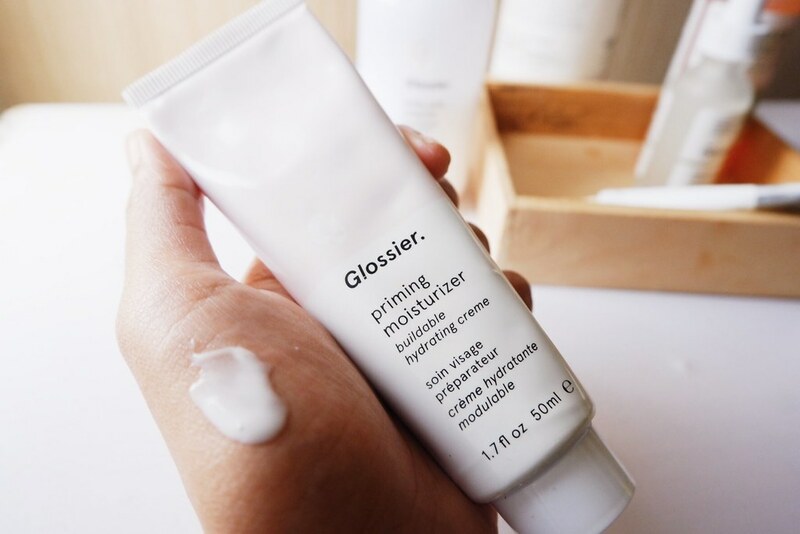 Currently, I’m using Glossier Priming Moisturizer. *If you noticed, I tried to keep my cleanser and moisturizer under the same brand. * It has a light watery formula and leaves a dewy finish. Since it’s a priming moisturizer, I only use this during daytime as it serves as a good primer. It’s pretty pricey but the 50 ml tube goes a long way. 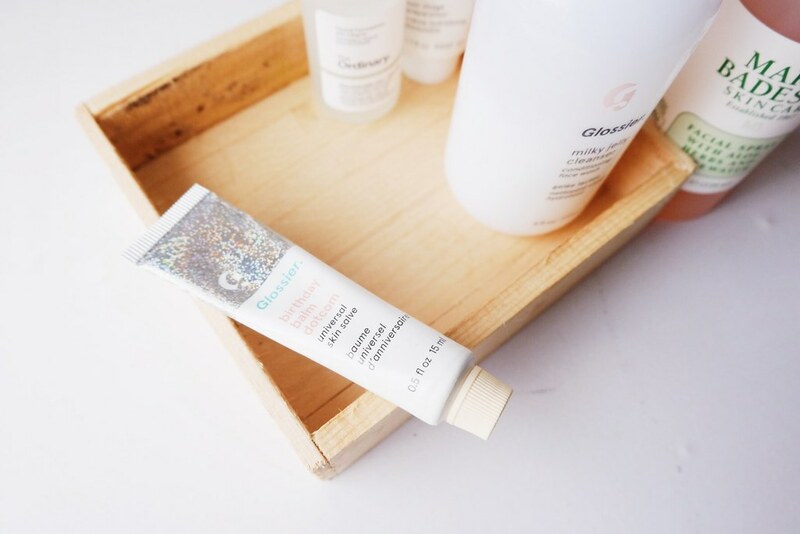 I’m using this cult-favorite universal beauty balm as this was part of the Glossier Phase I set which my boyfriend got me for my birthday this year. I was surprised to know the price because it’s just a small tube but boy, it works so well for my chapped lips! I apply this at night and in the morning, I can feel my lips are so soft and I can just rub my finger on it and see that it’s peeling smoothly. It’s eww I know but it softens my lips by removing the dead skin! This is optional but I highly recommend for you to have a facial spray if you have an oily to combination skin. 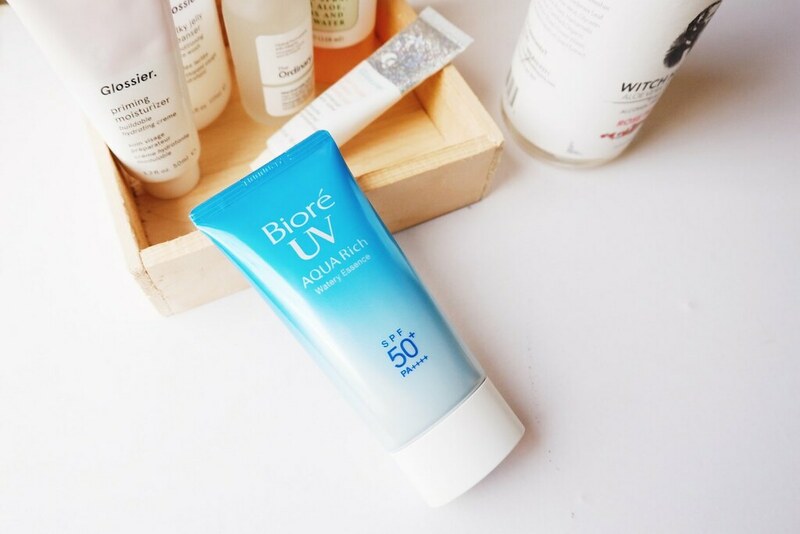 If you add this to your last step of your skincare routine, it actually helps seal all those products to penetrate deeper and absorbs faster. This can also be done during daytime to keep your skin hydrated. 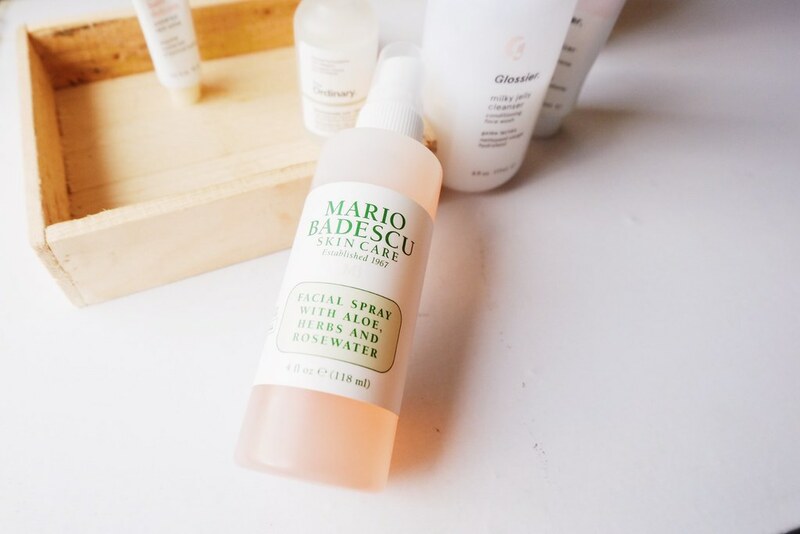 Every spritz of Mario Badescu Facial Spray makes me refreshed! As much as you’re cleansing your skin on a daily basis, of course, you have to exfoliate too to remove unwanted dirt and dead skin cells. I’m using St. Ives Apricot Fresh Skin Scrub for a year now and I’ve stuck to it since then. It deeply exfoliates leaving your skin fresh and glowing AF! My best friend Lyka recommended me this HG clay mask. I read a lot of reviews about it and so I decided to try it. I freaked out a bit when it says that you’ll feel your face pulsate as it cleanses and sips out sebum and dirt from your pores. The first time I used it with half water, half apple cider. I really felt the pulsating effect and I was tryna be chill knowing it’s normal. After washing, I noticed my face turned red but after it, I felt like my face was glowing. After two weeks of use, I noticed that my face wasn’t that oily. I’ll continue using this as this works well for me! My mom and sister are using it too. It took me a while before I found a non-Korean sheet mask and I’m so happy it’s locally made! I got my first two packs: Oh Sheet! Unicorn Bright and Oh Sheet! Rainbow Glow at the Trendsetter’s Bazaar for only PHP 60.00. Then I repurchased online. It was a little big for my face but it was okay. It’s really good that I never had breakouts after a week, unlike using K-Beauty sheet mask. My face was kind of glowing after and it’s super moisturized! I’ll keep restocking it and hopefully, they won’t stop producing it. There you have it! I hope this gives you ideas and brand options. This routine using the products I’ve mentioned costs roughly about PHP 6,800, it’s averagely pricey since it’s a mix of high-end and drugstore products which can last up to three months at the least. I just also want to remind you that I’m no expert about this, I’ve never visited any dermatologist and just these products based on my research have worked for me. A certain product may work for one person, but it may react differently to another but I still hope it works for you so you may skip the trial and error process. This is not a sponsored post. All thoughts and experiences stated in this post are entirely my own. I’m a fan of St Ives Apricot Scrub! I’ve been using this every other day though for I find it too harsh on skin when used daily. I have oily skin too, the reason why I’m also picky on skin products. Been addicted to skincare lately and I now splurge more on skincare than makeup. 😂 I also love the Sunflower oil and it has many uses too. You can try using it to remove your mascara. Its a life saver! you’re lucky to be born with great skin. Not all have been blessed to just use a few products to make their skin look great. I love these skin care tips. Thank you for sharing. I never really worry about skin care right now, but I think now that my girls are a little older I might have time to do it again.